The weather improved in the New Year still cold but nothing like we had in December. 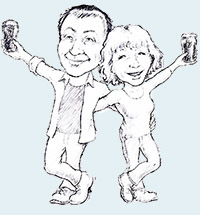 We went out to the Salutation Inn on New Year’s Eve our nearest pub in Pontargothi about 3 miles away. Usually ‘us oldies’ do not bother to stay up for the New Year!! It was a pleasant evening. The Salutation is another pleasant pub doing good food. Not being particularly interested in consumerism we resisted going to the New Year sales! Instead we just had a day here in the Cothi Valley. The following day we had a trip down to Laugharne to visit Dylan Thomas’ home the Boathouse situated on a cliff overlooking the estuary of the River Taf. He lived here for the last four years of his life and wrote many pieces of work including Under Milk Wood. Laugharne is an interesting ancient town having a castle first established in the twelfth century, a mixture of small cottages and Georgian houses. On the way down we saw 2 red kites, one actually over the Taf estuary. They are magnificent birds of prey whose numbers are increasing. We intended to drive along the coastal road to Tenby but unfortunately followed the SatNav directions along another more inland road. Tenby is a very popular holiday resort, its attractions being the fantastic beaches and views of Caldey Island. The town was even quite busy on a Bank Holiday in winter. A visit to the seaside is never complete without fish and chips which we ate at one of the many fish and chip restaurants. The following day we went walking in the Brechfa forest which is in the next valley to us. The Brechfa Forest is a mixture of ancient and managed woodland containing several mountain biking and walking trails. We had a good walk even if the weather was a bit cold and damp. Jonathan, our son, then had to start his return journey to Santiago de Compostela the next day first catching the coach to London and then spending the night in Stansted airport before catching his Ryanair flight the following morning. It makes it a long trip for him but he enjoyed his stay over Christmas and New Year. Next time he will try a more convenient flight and Ryanair are pulling out of Santiago anyway. So far in January the weather has been all right and we have been able to get around more easily and are starting to enjoy living here. We attempted to climb the Black Mountain situated in the Western part of the Brecon Beacons National Park and is a remote rugged area. Unfortunately the mist set in so we did not make it to the top so had to leave that for another day. We did have a very short respite in the weather for a few days but the cold weather soon returned well before Christmas. Luckily we have a Landrover which was a godsend in this weather and we were able to get out. However, no deliveries were possible so we have been limited as to what we can do regarding sorting ourselves out here.Whilst we don’t celebrate Christmas in a big way we have been busy sending out Christmas cards etc. 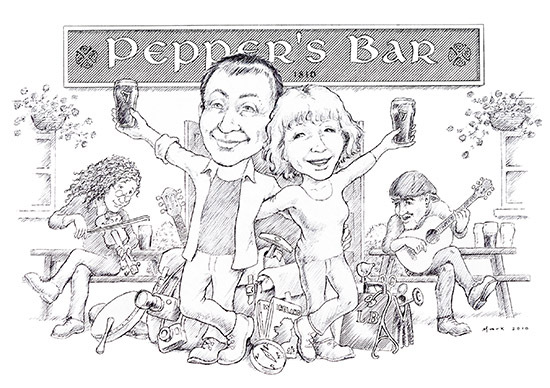 Our friend, Mark farmer, kindly did a cartoon of us (also featuring Martin Hayes and Dennis Cahill). Jonathan, our son, made it over from Santiago de Compostela in Spain for Christmas.. We thought he may have had difficulties firstly with the Spanish Air Traffic controllers striking and then with airports being closed due to the weather. We had a quiet few days just exploring the area visiting Llandeilo walking in Dinefwr Park nearby which has some lovely views and nice old ruined castle. Following that we had a good lunch in the Angel Inn in Landeilo which is a great pub and does good food. We eventually moved to Wales at the end of November 2010 just a few days before the worst weather in the UK since the 1960’s set in. 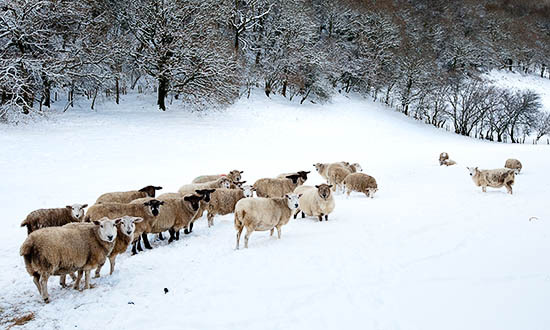 Luckily we had deliveries of oil and wood soon after moving otherwise we would have had a very cold time as the lanes around here were impassable and we did not even have post delivered for nearly a month. The house is very easy to keep warm and we only had one mishap with the water freezing in the UV filter outside. John, ever resourceful, soon had that sorted out and it is now insulated. We were lucky as some of our friends were without water for several days. The snow may be a nuisance but it was certainly very beautiful around here on the hills and trees so we took advantage of it with local walks to take some photographs.